As you can see on these two maps we made significant changes to our itinerary compared to the original one. When, after our stay in Amsterdam, we continued on our journey we realised that we had made more cruising days and motor hours since leaving Amersfoort in March than we actually liked, had spent less time exploring the surroundings than wanted and had lost a bit of our sense of unwinding (which was what it is all about, isn’t it?). Plus it was about the time that we had to arrange meeting points with our guests, in such a way that we can offer them a nice and interesting route and don’t run the risk of getting stuck somewhere because of problems on the waterways. Meanwhile we had been told that attending the rally on the Nivernais had to be cancelled. Because of heavy rains the Nivernais is closed to barges our size, just this season. Size does matter and big is not always a good thing. At the end of May the Canal du Centre was still blocked, due to a landslide caused by the abundant rain fall. Change was that the canal would be open again mid June, but we didn’t want to take the risk that it wouldn’t. And there were more stories going round about problems due to the rains. 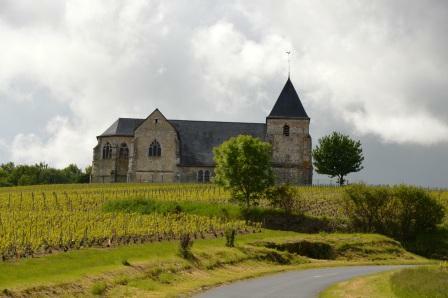 And last, but not least, we had discovered the Champagne region. Sloping hills, huge fields with rapeseed and with (small) vineyards and newly planted vines. So many colours! After the return trip from Amsterdam we had rented the car for another day and we made a tour of the region. That we wouldn’t mind extending by barge. 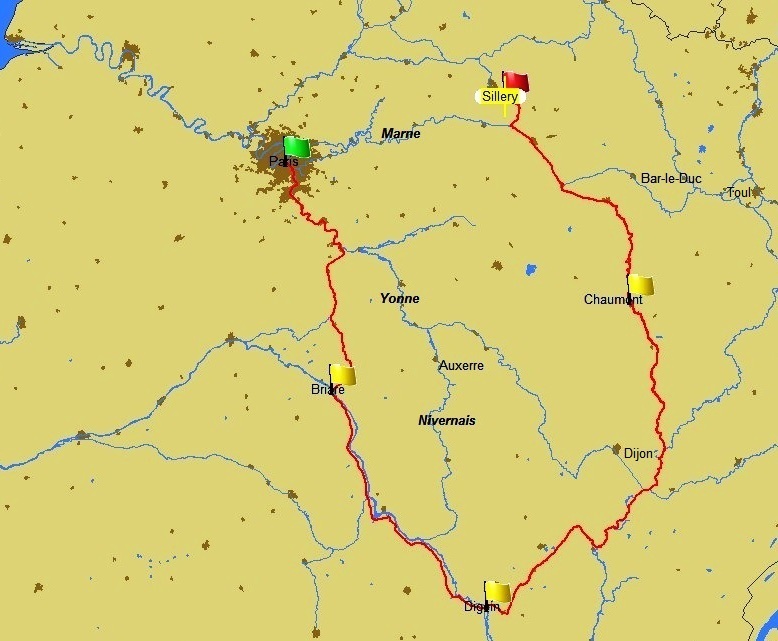 So we changed our plan to going to Toul and back (more about that later) then going South to Chaumont and back and then via the Marne to Paris where we will stay for a week at the end of August before heading for Holland. After Sillery there was a tunnel again, this one well lit on the side so you could see where you were going. 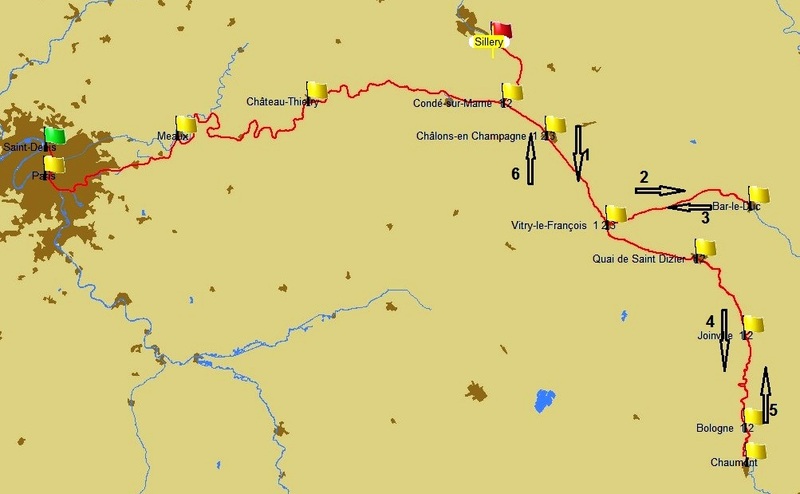 Starting from Condé sur Marne we began with the leg that we will go up and down this season. No problem to us because the return trip is always different from going up, plus you can visit all the nice spots that you sailed past in the first place. In Châlons-en-Champagne we were moored opposite the tents where a festival took place. Here we had to use our stakes for the first time, at least one of them, because our front spud pole wasn’t long enough and bollards were out of reach. 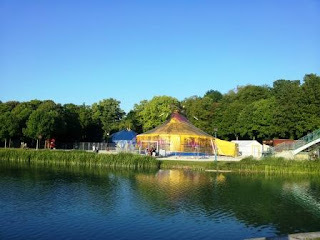 Unfortunately all tickets to the circus were sold but we could eat at the restaurant tent, enjoying the atmosphere and also the crêpe, made to order on the spot, fresh as they come. These are the best but you don’t find them too often, most times pre-baked. In Vitry-le-François, not a very interesting place, but with a very nice brocante/vide grenier, we turned left, wanting to cruise to Toul and back then with our guests. Once we were on the canal, and unable to turn for a while, we were informed that a lock, just before Bar-le-Duc, was out of order and it would take some time before it would function again. No problem, we are not in a hurry. Two days later the “some time” turned out to be another week. No problem, we don’t go to Toul but we’ll make a turn just after Bar-le-Duc. That is also unwinding, no problem. The damage was caused because a peniche (not the one in the picture) that had been rocking to and fro in the lock. On the picture you can see that we have plenty of room ahead, and aft as well, but a peniche has virtually no give, neither lengthwise nor width. So it is very important that they tend to their lines; the swirling water rocks the boat. Apparently something had gone wrong because the anchor – not from the ship in the pic – had come stuck underneath the girders of the door and lifted it as the barge came up in the lock. Just like that and then the lock is out of order. The Marne Rhine Canal is situated in different surroundings, more hilly, more woods and more half-timbered houses, clearly we’re getting towards the Alsace. From the beginning of the canal to Toul it numbers 70 locks, over a 85 Km distance, going uphill. To Bar-le-Duc it is just 30, which alone brings down your cruising speed. We are crawling through the canal and have ample time for bicycle trips, also up and down hill! Cute villages with lots of old houses and a spring for to fill the dogs canister. Alongside the canal there are numerous streams, so also lots of Ponts Canal where they cross and a large area in between which is a bit swampy, the “marais”. Beautiful scenery and you can cycle if you’re prepared to dip your feet from time to time. For Panache it’s homecoming and he loves it. The sides in this canal are rather sloping so we cannot moor up to the side, getting stuck before we are there (we leave the few quays and jetties free for smaller craft). We are rather good in swinging the ramp out with our crane and fixing it on our steps so we can moor a meter or so out. After a few years experience we make sure we have all the right stuff handy and know how to use it. Some things really make life easier. Yesterday we made a beautiful trip on our bikes to the abbey in Trois Fontaines, at least the ruins of the abbey situated in a very nice and spacious park, where the former annexes surrounding the abbey are restored and are lived in. Built in 1118 by Cistercian monks it was lived in until the French Revolution. 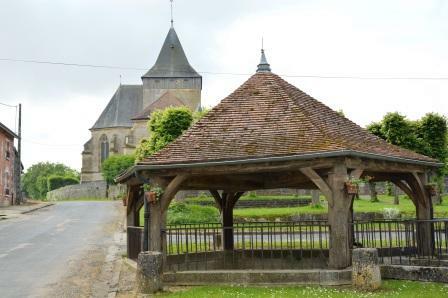 That is one of the things we look at with pleasure, all the villages with their old churches and nice buildings. Quite a jolt when at the next lock we saw the newly built houses, thrown in in a nice village. It is so out of order you cannot call it ugly, it’s just amazing that someone made it up. On the left the village on one side of the lock and on the right the former lock keepers house, behind it about 20 semi detached boxes, with their polished metal sheets. We will continue our trip along this canal, next blog will be about the Marne Saône Canal.